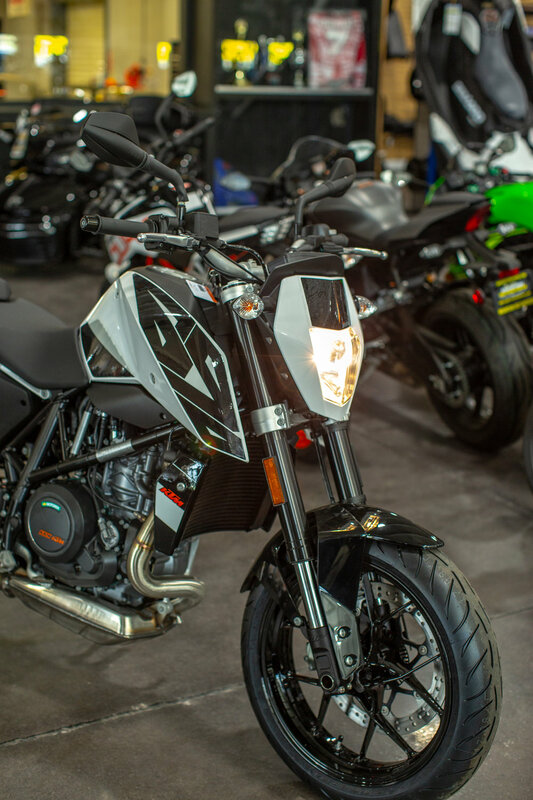 The 2018 KTM Duke 690 is a tribute to the original Duke 620 released over two decades ago. The Duke 620 is often referred to as a streetmoto, a more refined version of the often hooligan manned supermotos. Following the same line as the original Duke, KTM is dubbing the 690 Duke the “smooth criminal”. After a short ride on this 690cc single cylinder, I can absolutely agree with that tagline. 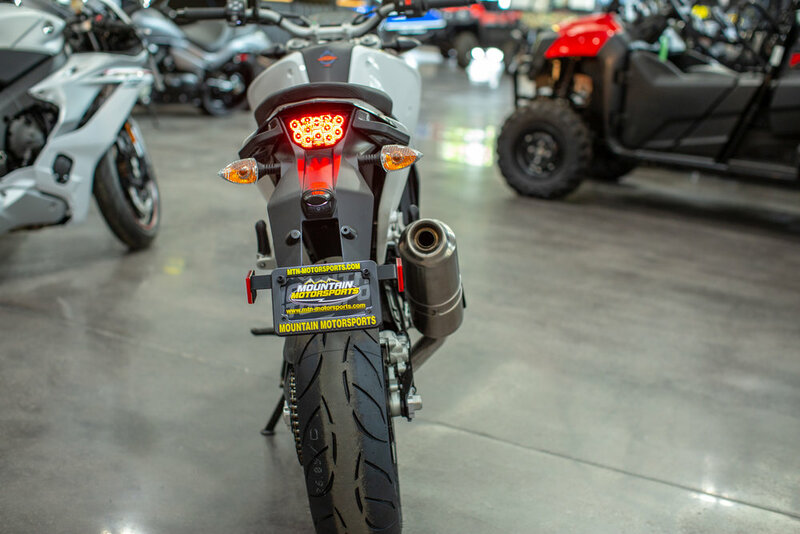 This motorcycle reminds me a lot of a supermoto, the seating position is very upright, there is a ton of leg room and you feel very high up on the bike. KTM completely reworked the cylinder head, using an ultra light piston and connection rod, rerouting the air intake and providing the crankshaft with sleeve bearings. The result is a huge power band and power delivery that is relatively uniform at any engine speed. Twin ignition featuring plug-selective mapping assisted by the advanced ride-by-wire allows this huge single cylinder to be somewhat smooth and manageable. The Duke 690 is said to have a dry weight of 327 lbs and provide 72 HP and 55 ft lbs of torque. Suspension is composed of 43 mm front forks and pivot-arm articulated pressurized-gas monoshock, both by WP. As for ergonomics, the seat height is 32.87 inches and the positioning of the foot pegs allow for plenty of leg room even for a very tall rider. The handlebars felt very narrow but allowed for precise steering inputs. 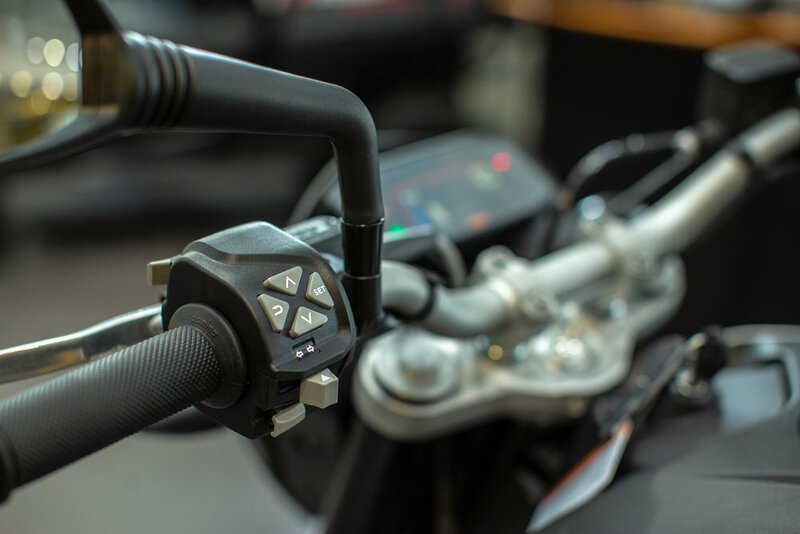 Hand controls are both hydraulic with the front brake lever offering a dial for personal adjustment. Foot controls were a little hard to reach but with a quick adjustment, it should easily suit any rider. Shifting is smooth and gives great feedback with a solid click that the bike is in the next gear. Around town, the power on this bike was more than readily available, it was very punchy even with the RBW system meant to smooth out the power. On the highway, I was searching for anything to hide from the wind. I would strongly advise purchasing a touring windscreen to make highway riding enjoyable. In sixth gear, the engine still has pull when you roll on the throttle - a big plus for this bike. As with any engine with a huge bore the engine braking is very extreme but useful for bringing the bike to a desired speed very rapidly. Some things that stood out on this first ride was how easy KTM has made navigating the TFT display menu. The control layout is simple and effective utilizing only up, down, back, and select. It should in my opinion be a standard that I would love other motorcycle manufacturers to mirror. On the subject of mirrors, the Duke 690 has these huge bulky looking mirrors that take away from the general sleekness of the bike, but they actually work and allow you to see behind you. Where most mirrors have your shoulder taking up half the mirror no matter where you position them. The only big negative of this bike is how the TFT display is mounted almost parallel to the ground, this forced me to lean forward and look directly down to see any information. Something that is a huge annoyance and safety concern when doing something like monitoring your speed on the highway. I would recommend this bike for someone who wants the feel and riding position of a supermoto but with the power delivery of something like an SV650. The Duke reminded me of both those bikes throughout the ride. 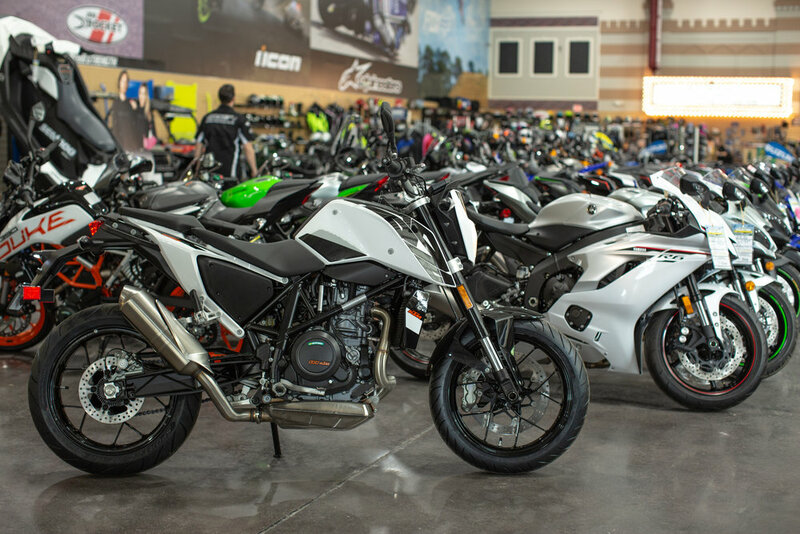 If you are looking at something like the MT-07 but want a single cylinder in your face streetmoto then the 2018 KTM Duke 690 is for you. 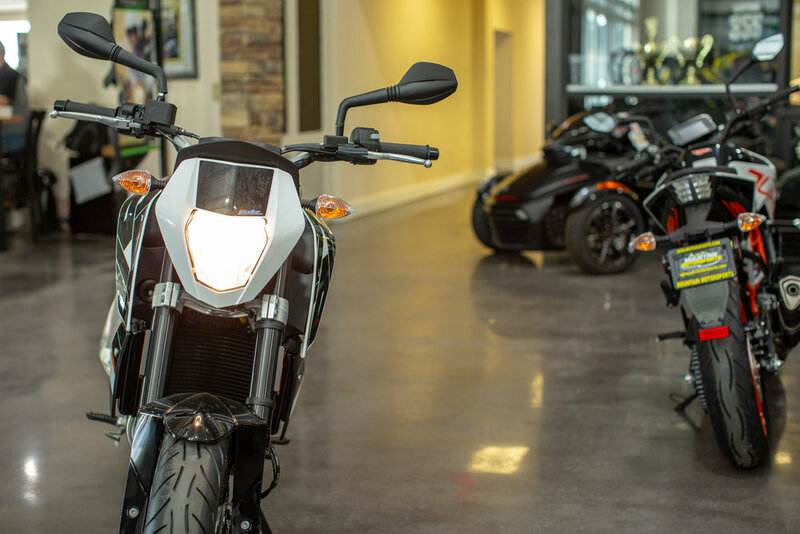 Join the C2W newsletter to be the first to get the latest updates, news and info on the First Ride series on the Chaseontwowheels YouTube channel! Information shared here will remain private and not be shared ANYWHERE.